The contrast in Narendra Modi and Rahul Gandhi's speeches Tuesday delineated the battle lines for the coming Lok Sabha elections. New Delhi: For Congress president Rahul Gandhi, India’s air strikes on a terror base in Pakistan never happened. Or so it seemed from his speech at a public rally in Guwahati Tuesday afternoon, about 10 hours after the Indian Air Force (IAF) pounded terror outfit Jaish-e-Mohammed’s base in Balakot, Pakistan, with 1,000-kg bombs. “Indian Air Force pilots ko badhai,” said Gandhi, as he started his speech, complimenting the Mirage 2000 pilots who conducted the air strikes, without referring to the operation itself. He then moved on to other issues such as the “ideology of hatred and violence” pursued by “Modi, RSS and BJP”, contrasting it with the Congress’ message of “love and non-violence”. About 2,100 km west from there, in Rajasthan’s Churu, Prime Minister Narendra Modi was also addressing a rally around the same time. He left none in doubt about the “importance” of the day as he started his speech with an assurance to the nation that India was in “safe hands”. He then took repeated vows, swearing by “Mother India”, not to let India down, before moving on to the government’s proposed Rs 6,000 annual assistance to farmers and the Ayushman Bharat health scheme. 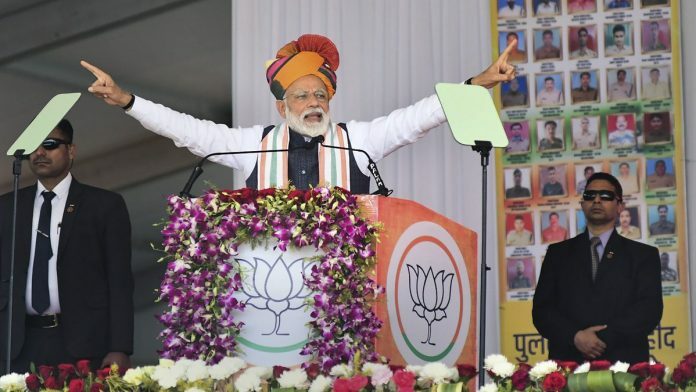 1) 56-inch chest jibe: Addressing a rally in Gorakhpur in January 2014, Modi had said that it would take a 56-inch chest to convert Uttar Pradesh into Gujarat (in terms of development). He used this jibe against the Prime Minister very often in different contexts — continuing terror attacks, unemployment, defence deals, et al. After the air strikes, opposition leaders may not be inclined to talk about it again although leaders of the ruling Bharatiya Janata Party (BJP) are unlikely to let them forget this. 2) Rafale ‘scam’: The opposition had been going hammer and tongs at the alleged corruption in this fighter jet deal over the past few months. With most opposition leaders facing investigations on corruption charges, Gandhi led the pack to launch a no-holds-barred onslaught against Modi, accusing him of favouring industrialist Anil Ambani in the defence deal and coining the “chowkidar-chor-hai (watchman is thief)” slogan. After Tuesday, the opposition parties will attack Modi for compromising national interest in a defence deal at their own peril. 3) Farm distress & joblessness: These were the two issues Gandhi and other opposition leaders were constantly raising to target the Modi government. At a time when national security looks set to become the central theme of all electoral discourse, there are doubts about the effectiveness of these individual concerns, with leaders of the BJP set to play up the nation-or-self question as a counter to all other narratives. 4) Hug-and-wink politics: In the Lok Sabha last July, Gandhi spoke about how the BJP had “nafrat (hatred)” for him but he had only “pyaar (love)” for them. After finishing his speech, he walked up to Modi and hugged him and later winked at his colleagues. The BJP and the RSS’ ideology of “hatred” as against the Congress party’s belief in disseminating “love” has been Gandhi’s pet theme. He repeated it in his Guwahati speech Tuesday. But at a time the nation is celebrating air strikes against Pakistan, it’s difficult to say how much his propagation of “pyar aur ahimsa (non-violence)” as a poll plank will find resonance. 5) ‘Gathbandhan’ or alliance politics: There are about 20-odd opposition parties, mostly regional outfits, which have been holding joint rallies as a show of solidarity for what the BJP sees as the single-point agenda of ousting Modi. Opposition leaders held out many reasons for their attack on Modi — victimisation of opposition leaders, demolition of institutions, and the “failing” economy, among many others. In the absence of any seat-sharing arrangement among most of them, and given their conflicting political interests, their so-called gathbandhan was already faced with a crisis of credibility. The BJP’s projection of them as an opportunistic alliance solely aimed at removing Modi is likely to further undermine their credibility in public eyes. it helps no one if an impression gains ground that issues of war and peace are being influenced by electoral politics. This is certainly ONE occasion when Rahul Gandhi was stumped in coming up with SOMETHING, even if totally unconnected and inane, to attack Modi using an issue ( or even a non issue).. He is used to going off tangent and pick some childish and meaningless acronym ( Gabbar Singh Tax for GST, Khao Commission Rao for KCR and his highly silly, Suit Boot ki Sarkar etc) to demean whatever Modi is trying hard to achieve and attempt to belittle Modi as a ‘person’. His so called love ‘hug’ was instantly exposed as completely hypocritical and HOLLOW immediately after, when he went back to his seat and ‘winked’ at his sycophants, with they duly and obligingly applauding him. The rest of the opposition comprising the likes of Mamata and Naidu do not even deserve a mention. Let’s pray to God that the situation does not escalate. Poor masses will die for no crime of theirs. If it does, then the present article will be deemed to have been written prematurely. Elections are still very far and heroes can become villains and vice versa. As things turn out, the script has played out exactly according to their “alleged” plan. I say “alleged”, because the truth will come out only if and when a thorough investigation is conducted on the causes of that intelligence “failure”. Actually the strike has not come a day earlier than needed. It was high time for the govt to take such steps viewing the security situation at the border and the killing of so many security forces and the army personnel at the hand of Pak sponsored terrorists. Instead of feeling sanguine over the strike the govt should further concentrate on securing the countries interest. There is no fun in turning the necessity into virtue. Making it a election issue is very mean. However, we should congratulate the brave and precise action of airforce in striking the terror base even inside Pakistan apart from those in POK.